"Outside in the courtyard, I hear the Gypsies settling in - someone laughing, someone pulling out the drum, someone making rasgueado and turning around the sound, and when I look through the open door to the earth beyond, I see Rafael stomping at the dust at his feet and the dust rising like fog." In Small Damages a pregnant American teenager is shipped off to Spain, where a couple is waiting to adopt her child. Keeping the baby would derail Kenzie's college plans and her nascent career in filmmaking. No one, other than her mortified mother and her Yale-bound boyfriend, needs to know of her misstep. Her cover is that she is learning how to cook Spanish food and improving her language skills. In Spain, however, Kenzie realizes there are more choices to make. The backstory unfolds slowly in shuffled flashbacks while exploring Seville and working on a remote bull ranch. This exotic setting is peopled with multidimensional characters who are distinctly Spanish. Shy and modest Esteban isn't a typical romantic hero, and Estela, the cook with a past, hides her generosity behind a gruff exterior. As the gypsies come and go, their music lingers. This book engages all the senses so that the reader is there in the moment with the protagonist. Kenzie is self-absorbed at first, but that's understandable given her difficult situation. Her mother's insistence on hiding the accidental pregnancy seems rather anachronistic. Her boyfriend refuses to see this as his problem too. Both her mother and her boyfriend had suggested abortion, but Kenzie had refused. Still grieving the death of her father, she sees the fetus as a link to him. The narrative dutifully follows the convention of young adult literature by side-stepping abortion. In this novel, choice is not political, religious or even moral; it's a personal decision. I'd recommend Small Damages to mature teenagers and to adults who enjoy literary fiction. It will be released tomorrow on July 19, 2012. Simmering with secrets, savory flavor and dusty heat, this book is seasoned just right for summer. and her gorgeous photos of Spain. 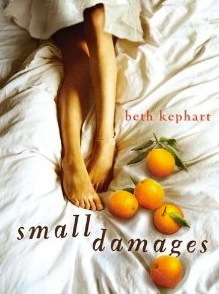 Small Damages received starred reviews from Kirkus and Publishers Weekly. It was also reviewed in the NYT Books section last weekend. Disclosure: Author Beth Kephart is a blog buddy. I received a free ARC from the publisher on my request. Wow, Sarah. Thank you so much your intelligence and your generosity. Your life is filled with many things. I'm honored that you have taken the time to both read and consider this in such a lovely way. What a great review...thanks for sharing this. Interesting review. It makes me want to read the book. Is it set in the current day? One of the things that annoy me about my current abode is that I simply can't lay my hands on all the books I want to read.. well for people like us, there is tomorrow. Many thanks for your thorough review. It was short and yet so to the point and informative all the same. One of the reasons why I would like to read it is that I've been to Spain a few times (south, north and northwest) and I have fond memories of my time there. Well done to Beth Kephart. Lovely review, Sarah. It makes me want to read the book even more than I already did - which is saying a lot! Beth, it was my pleasure! Serena, welcome to my blog and thank you! Pamela, this seems like your type of book. SG, the time isn’t specified, but I’d place it in the 1990s before cell phones. Our expat friends in France got Kindles so that could read American books that weren’t available in their country. That might be an option in India too. ACIL, I’d love to hear your inside perspective on this novel. I think you’d enjoy Beth’s writing. Kimberley, thank you and welcome to my blog! It’s nice to connect with you. Great review. What a cute puppy. And I like your husbands choice of historical novels. And then it must be said I'm catching up as it took many weeks to replace our virally deceased computer and several visits to the Mayo Clinic to deal with several medical issues myself. the hidden pregnancy in this day and age does seem anachronistic. however, this book had me at remote bull ranch in seville....am adding it to my vacation reading list for next month. I don't often read YA, but with your review and excerpt, plus the NYT's "dreamlike," I'm adding this one to my list! Ooh, this sounds wonderful! Just requested it from my library. Congrats to Beth for getting a NYT review--wow! That's one of my "someday, I swear!" goals.